Platformers have always thrived on Nintendo systems, and with the proliferation of indie gaming and the popularity of the Switch, it’s a genre with countless offerings on the eShop right now. The downside? There’s a lot of mediocre titles to shuffle through. Luckily, nobody with discerning tastes will consider Daggerhood one such lackluster entry. Still, good and satisfying are two different things depending on how you prefer your platformers. Vincent S. Daggerhood is not only the game’s namesake, but a hero inspired by Arthurian legends, who steals from greedy nobles to give to the poor, not simply because it’s awesome, but because he relishes his position as the best thief who ever lived. But, as Buddy Holly taught us through song, you can fight the law for so long. Which is why Daggerhood was promptly caught and tossed into a pit before the game even begins. Our hero is determined to climb his way out though while picking up treasures and rescuing fairies along the way. His only weapon is his magical dagger, which flies at enemies, but can also teleport Daggerhood to wherever he tosses it. 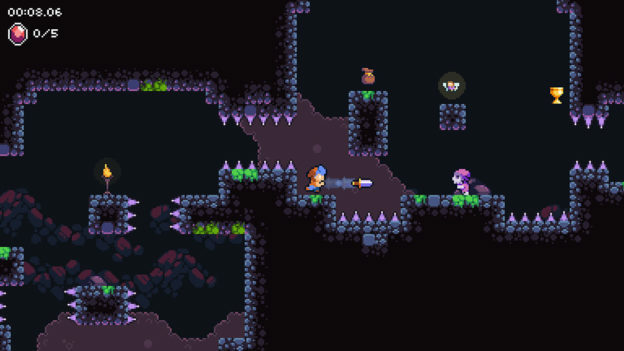 The tossing of the dagger and pulling off flawless teleports over obstacles like spikes takes some getting used to, and frankly, I was never able to perfect it. But that’s where the challenge of Daggerhood lies. It’s easily intuitive, but hard to master, like any great game gimmick. Each level rates you on how quickly you complete a level, which is further inspiration to hone your platforming skills. 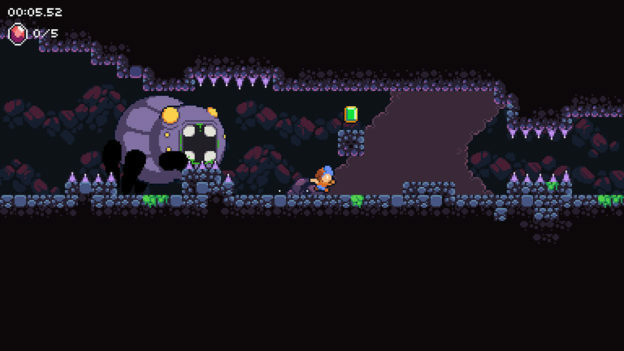 Seasoned platforming fans will breeze through levels, which are admittedly rather short. In any other game, I would mark it down as a fault, but certain levels felt endless after dying in them over 10 times. Which goes to the one gripe many might have with Daggerhood: it’s tough as nails. If we’re rating it on a scale of 1 (Kirby’s Dreamland) to 10 (Kaizo Super Mario World) it’s about a 7. But as long as you’re persistent, the game isn’t impossible, and there are no “lives” to speak of. In fact, you may even learn from your follies and beat the level that much faster. Plus, the game just looks great. Fans of pixels will be right at home, where levels, enemies, obstacles, and even Daggerhood himself look straight out of some hidden gem SNES game you overlooked in your childhood. 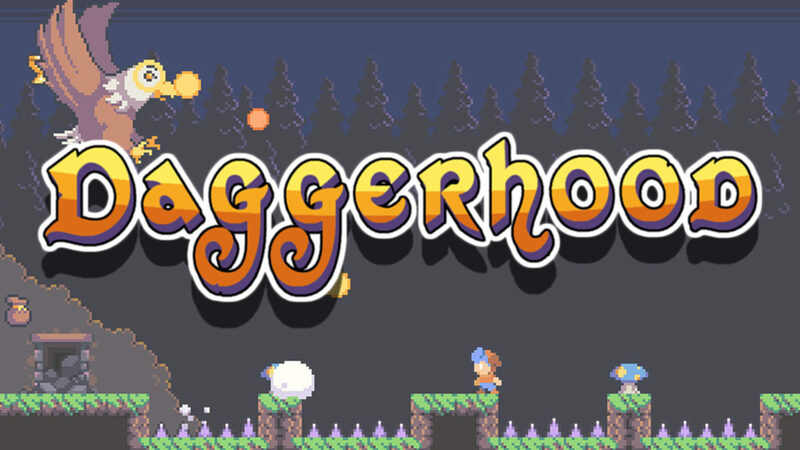 Daggerhood isn’t a platformer built with everyone in mind. In fact, even a few die-hards may find it to be a little too difficult. If you’re looking for a platformer that’s far-flung from the easier titles the genre is known for, it’s not a bad place to start. It may be the only Nintendo Switch eShop title under $5 that not only gives you more bang for your buck but has an incredible amount of polish.